Capable of firing in extremis whilst still attached to its wheeled carriages (although with limited traverse or elevation), the 88 could be fully deployed onto its cruciform firing platform and ready to fire in around two and a half minutes. Many 88s were fitted with a large gunshield although there were many examples of this being dispensed with. Being such a large and heavy weapon it could only be towed by larger prime movers such as the Sd.Kfz 7 halftrack. The 88 saw service during the Spanish Civil War as well as on all fronts in which the Germans fought during WWII. Capable of penetrating armour plate up to 108mm thick at ranges of up to 1,100 yards, the 88’s fearsome reputation grew immensely during its service in the Western Desert where it was one of the very few weapons capable of dealing with the British Matilda II infantry tanks. A similar scenario unfolded on the Eastern Front as the 88 was among the rare weapons able to tackle the new Soviet T-34 and KV tanks. 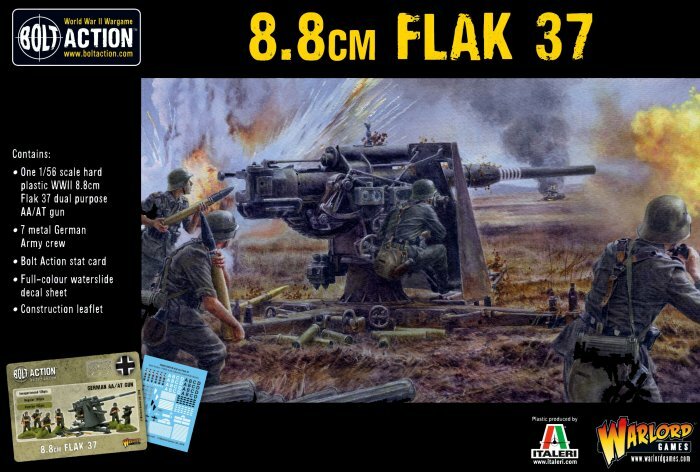 The Flak 37 was the final production iteration of the 88, being almost identical to the Flak 36 bar the updated instruments allowing for a greater level of autonomy in fire control.